In partnership with the U.S. 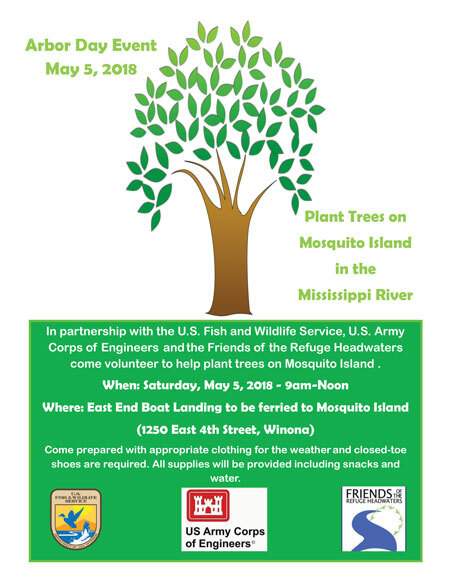 Fish and Wildlife Service, U.S. Army Corps of Engineers, and the Friends of the Refuge Headwaters, come volunteer to help plant trees on Mosquito Island. Meet at the East End Boat Landing to be ferried to the island (1250 E 4th St, Winona). Please come prepared with appropriate clothing for the weather and closed-toe shoes are required. All supplies will be provided including snacks and water. Please RSVP to Gayle Maule at either 507-494-6220 or gayle_maule@fws.gov. RSVPs are important in case we have to postpone due to river conditions. Click on image for a printable PDF of the event flyer.